* This article has been re-posted from the blog Culture on the Edge: Studies in Identity Formation. 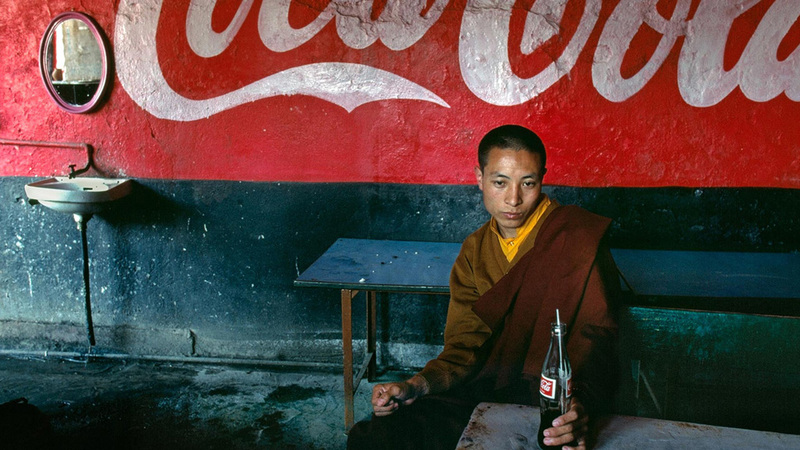 I think it’s worth pausing for a moment to ask why the above photo, recently used as the cover image on the Culture on the Edge facebook page, “works.” Given the theoretical goals of this research group (more on that under Identity), why this image of a young Tibetan Buddhist monk (or at least someone dressed up like one, of course) drinking so casually from a pop bottle. What do we assume it “says” and about whom? What I find intriguing about such photographs is how firmly they re-entrench traditional stereotypes despite seeming to undermine them (a problem I find in many current studies of identity). For what presumably makes the situation worth framing in distinction from the limitless, centerless, and thus ambiguous background that comprised the setting that day–i.e., what made the photo worth taking–were sets of assumptions about religious people in general, and Buddhist monks in particular, being somehow other than human, historical subjects–for they’re set apart from “the outside world,” meditative, detached, passionless, spiritual, etc. Without these assumptions, I’m not sure a picture of someone sitting in a tea shop drinking a soda, regardless of the locale, is all that compelling. For it likely happens across the globe millions and millions of times each day. Speculations on the young man’s tranquil inner state are evidence of how the captionist, the observer, is the one who creates the impression of incongruity, as opposed to it being a found object in the wild. For without the set of assumptions that we bring to the situation–assumptions reproduced in almost any world religions class–I’m not sure there is a contrast here between two things characterized as distinct cultures. Instead, there is just an apparently thirsty man making the mistake of taking a break in front of a tourist with a camera. If this is how we choose to view it, seeing instead just a thirsty man, then the photo likely loses much of its appeal–for its edgy provocativeness depends upon the viewer reinscribing assumptions of Buddhism and Tibet as unique, far away places, freed from the mundane concerns that occupy us in the rest of the world. “The Cup,” a 1999 motion picture, also comes to mind as an example of this problem–for seeing the main character as a football (i.e., soccer) fan is not sufficient to give the narrative its edge. “Far from the influence of the outside world…” opens the trailer’s narration, with the strategic pause before revealing that, contrary to the viewer’s likely expectation about enlightenment and detachment comprising his “destiny,” soccer is instead “his one true love.” This contradiction of other-worldly pursuits and World Cup desire, and how the young boy overcomes it, is the narrative’s hook. While all sorts of people likely have not been able to watch the soccer finals, for all sorts of reasons, their stories are probably not worth telling. But this one is–and it is because of the reinscribed assumptions that many think are being shaken off in this film’s efforts to humanize these social actors. Of course what I’ve said here is little different from what Donald Lopez argued back in 1998 in his book Prisoners of Shangri-La; “Tibetans,” he writes in his introduction, making reference to the classic film “Lost Horizon” (1937), “are portrayed as ancient conservators of a timeless wisdom in a timeless realm, now thrust from their snowy sanctuary into history.” Ironically, Lopez finds this same portrait still exists today–and it is in contrast with this image (which is none other than a strategically useful impression, perpetuated by a variety of social actors for a variety of purposes), that the Coke sign and the pop bottle can be judged as constituting incongruity. (Clicking the link for Frank Capra’s film, just above, reveals a fascinating story of the test audience’s initially poor reception of the film, based on the image they came to the theater with, evidenced in one audience member dismissing it as that “Fu Manchu thing they’re showing”). So what is happening in that cover photo on our facebook page? My hope is that it doesn’t simply communicate incongruity to observers (the same incongruity that prompts political observers to be puzzled by the motives of Buddhist protestors in, say, Myanmar or in China) or be seen as curiously humanizing that young initiate. I also hope that it doesn’t represent two cultures bumping into one another. Instead, I hope that it prompts viewers to consider the role they, as observers, play in creating the impression of incongruity and why that young boy would even need humanizing in the first place–as if he wasn’t already human, already in the world, and thus always in history to begin with. For worldwide, kids now drink pop, simple as that. That we see this particular young boy, dressed in this particular manner, as worth noticing, as worth framing and thereby distinguishing from the rest of the world around him, says far more about us than it does about that thirsty kid. Russell McCutcheon is a Professor in the Department of Religious Studies at the University of Alabama. Interested generally in issue of theory in the study of religion, and specifically in the social and political utility of the very term “religion” itself, he has worked at three different public universities in the US. He came to Tuscaloosa in 2001 to be the Chair of the Department, a role he played until 2009. He teaches a variety of courses in the Department, on such topics as the rhetoric of religious experience or authenticity, and continues his research on such topics as religion and modernity. He also has a dog, Izzy. This entry was posted in Religion and Popular Culture, Religion and Society, Religion and Theory, Southeast Asian Studies, Theory and Method, Theory in the Real World, Uncategorized and tagged Buddhism, Buddhist monks, Culture on the Edge, Donald Lopez, Frank Capra, identity, Lost Horizon, Prisoners of Shangri-La, Russell McCutcheon, The Cup. Bookmark the permalink. One Response to Kids Drink Pop, So What? A good reference for this discussion is Sturken and Cartwright, Practices of Looking, now in its second edition. It is the core text for our Cultural Studies Intro course, and is also used in a third year theory course for our Cultural Studies major. It is worth checking out, and frankly, would help shorthand some of the more unself-reflective elements in religious studies perspectives pointed out above.